I was stopped at a light and looked over and saw some pretty flowers. The cute town of Ebern! I set up a "flea market" and displayed a few mini albums, coptic books, and a scrapbook filled with layouts for class members to flip through. At 10am sharp (cuz that's how Germans roll, and I like it!) we began! There were 17 attendees and each one created a pair of lovely layouts! 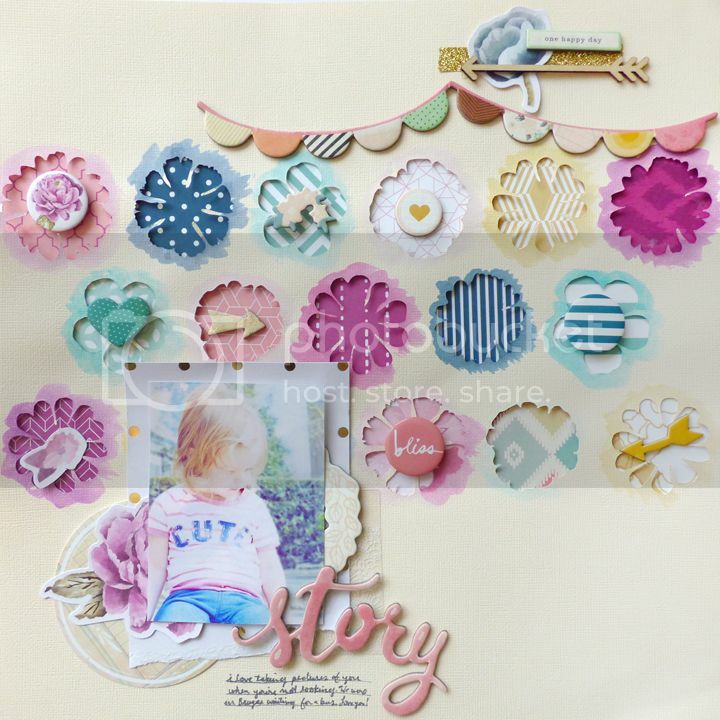 DESCRIPTION: I made a similar layout in Paige's Pages 04 at Big Picture Classes and wanted to try the technique again, adding a few more embellishments. JOURNALING SAYS: I love taking pictures of you when you're not looking. We were in Bruges waiting for a bus. Love you! HOW TO: Trim (17) 2” squares then adhere them to the back of a die cut floral cardstock base using foam adhesive. Use watercolors to outline each flower – matching the color of paint to the color of the patterned paper. Layer a photo over gold polka dot paper (tear off the bottom edge) and adhere it to the bottom left corner. Tuck a piece of wreath chipboard and doily transparency under the right then a flower and journaling spot die cut under the left of the photo. Place a chipboard “story” on the bottom right corner of the photo and journal with a pen below the title. Tear off a piece of gold glitter tape and place it on the top right corner of the layout then embellish with a wood veneer arrow, chipboard sentiment, flower die cut, and a chipboard banner. Embellish the inside of the die cut flowers with badges, chipboard stickers, and flower die cuts. DESCRIPTION: I love layering color-on-color in a 2x2 grid so that's what we learned how to do! JOURNALING SAYS: Our food was so incredibly delicious, I want more! HOW TO: Trim all of the die cuts from the patterned paper and sort them (along with the package of “Let’s Eat” Elle’s Studio die cuts) by color: pink/red, blue/green, yellow, and gray. Using a template, cut a polaroid frame from pink, yellow, green, and gray patterned papers then adhere them in a grid on a blue striped background. Add a photo inside two of the frames. Embellish each frame with the same colors of supplies – die cuts, enamel dots, wood veneer buttons, etc. Place blue letter stickers in the blue frame for a title and journal on the gray frame. Splatter watercolors over the frames to finish. The final step: splattering watercolors! Hope to be back at Ebernscrappt again soon! How FUN! LOVING the photos and the layouts you created for the event! GORGEOUS!!!!!!!!!!! Thanks for sharing the FUN! 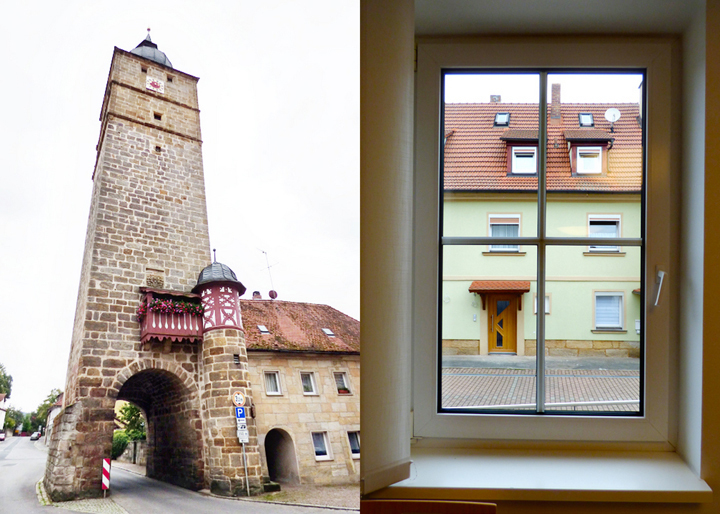 German towns are just lovely, aren't they!? Looks like a great group! I love how scrapbooking brings people together!